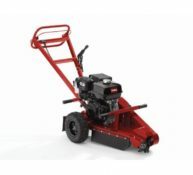 Toro‘s SGR line of handle bar grinders are great for grinding small stumps in areas with tight access. Well-balanced, easy to operate and simple to maintain, these models provide some of the smoothest cutting performance of any handle bar stump grinder on the market. The secret is our exclusive, Quadrublade™ tooth design, which cuts like a router without “pulling” the operator into the stump.